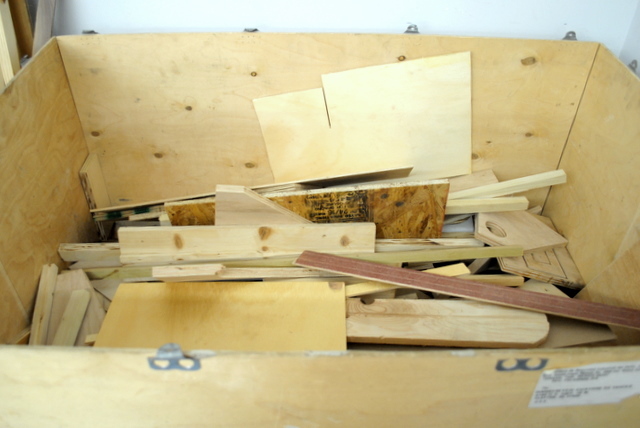 I took this photo of the wood scraps bin at TechShop Tuesday night. It was supposed to accompany an inspiring post about using scraps for your woodworking projects. That’s my hand. 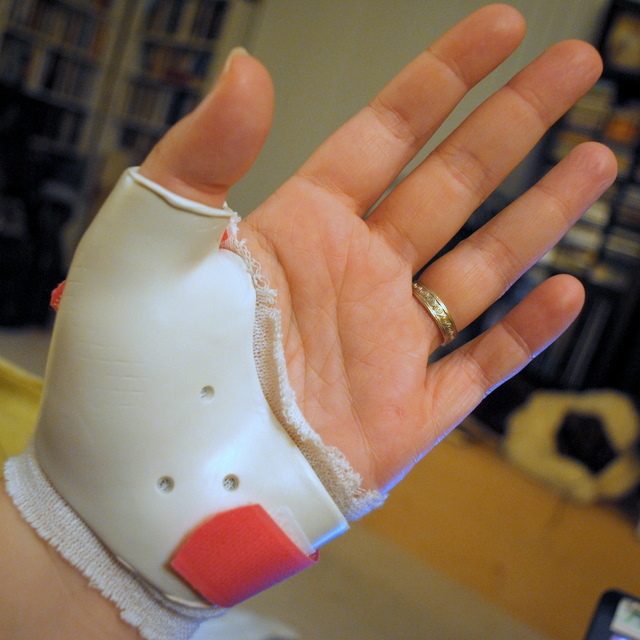 I’m taking a few days off from projects to let my poor torn ligament heal (good news: it’s not broken). I’ll return next week to finish project 23 and start project 24, whatever that will be. Hint: it’s probably not knitting. This is one of those days when a small difficulty in the project is making me avoid it while I think. My frame doesn’t have a nice flat spot on the back for attaching any boards. I’m imagining a solution that includes glue and maybe driving a couple of small nails through my beautiful faux silver leaf, but until I get the materials together and put my hands on it I won’t know. I’ll work on that tonight. This is one of those projects that I had on my to do list for a year before starting the blog. I’m going to turn last week’s silver leafed frame into a hidden jewelry box. This project will give us some much needed storage in our bathroom and will hopefully just look like art. Wish me luck! Behold the completed wine crate planter! We staged some vegetable starts in it so we could see it with something inside, but eventually Laurie will fill the planter with soil and plant directly in it. I hope she’ll let me see it when it is full of lush, beautiful plants. – Like I mentioned before, the purpose of the inspiration project was to make garden planters from free materials. But without a free source of wine crates and the other hardware involved the project wasn’t at all free. If you really want to be resourceful there are lots of other things you can use as a planter. – Being flexible with your design helps when confronted with a lack of ideal tools. Laurie ended up changing the design of her posts when it turned out she needed to use a hand saw instead of a circular saw for the cuts. The end result still looks great. – This week I took a bit of a breather and helped a friend with her project. It was fun, though I kind of missed having one of my own going on (I’m busily working away on a project that will be featured in a couple of weeks, so don’t think I’m idle over here). I hope you enjoyed Laurie’s project this week! Join me next week as I let you into my kitchen for an annual Easter tradition. The wine crate planter project captured Laurie’s imagination after she saw it in a gardening book. Her first mission was to find wine crates. These aren’t the sorts of things that people tend to have laying around. After a hunt she managed to buy some from a woman who had some in her basement. They’re beautiful items that make a statement, but they didn’t exactly make for free and easy planters like the book suggested. If you want to build planters from reclaimed materials you might want to start closer to home. Check out these chairs and hanging football planters, this basketball planter, or these rain boots for inspiration. If you happen to have some empty wine crates sitting around all the better! Tomorrow I’ll show you the beginning of the wine crate planter building process. This weekend I teamed up with my friend Laurie to build a custom planter from an old wine crate. Inspired by Alys Fowler in her book, Garden Anywhere, Laurie built a beautiful planter with her own personal touches. I’ll show you the process and the great finished project this week.